The company says savings of time and labour can be significant and in one case, a typical week out of service to clean a compressor cooler was reduced to four hours using a Kamco Scalebreaker pump and chemicals. SCALEBREAKER pumps have been designed to be easy to use by normal maintenance staff, although Kamco says support and guidance is available with every pump. 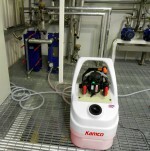 Kamco says pumps can handle even the strongest acids or detergents, and are built for a long, maintenance free life. During use chemicals are contained in hoses and tank, keeping operators away from fumes and splashes. Kamco says pumps incorporate a unique flow reversing device which enables the direction of circulation to be instantly reversed, giving quicker and more effective descaling and flushing. All units are designed for portability having integral 200mm wheels, although even the largest model, the C210 with 125 litre tank, can be lifted and carried by one man.